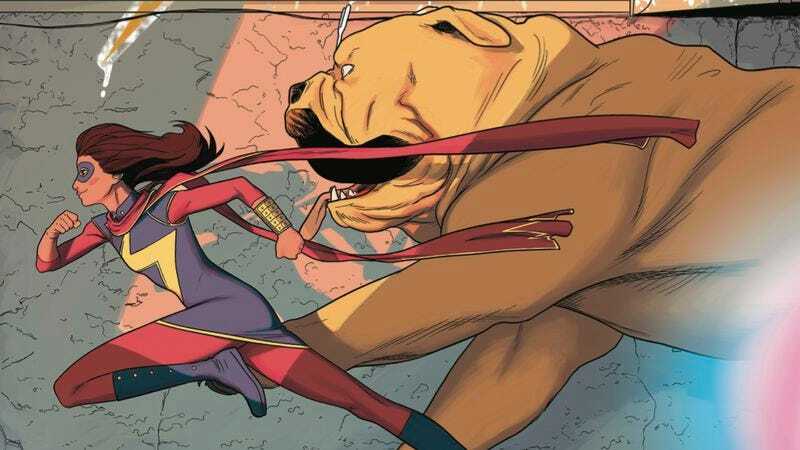 Kamala Khan has quickly become one of the most captivating characters in superhero comics, and this preview of next week’s Ms. Marvel #10 shows exactly why. After rescuing a group of teens that have been used as living batteries for The Inventor’s machines, Kamala discovers that the runaways are willing volunteers, offering up their bodies to harness energy that won’t hurt the Earth. They’re an “extra generation” on an overpopulated planet, and this is their way of helping in a world where they feel useless. And Kamala thinks that’s a bunch of crap. Kamala’s response to these teens’ defeated mentality showcases her intelligence, confidence, and ability to inspire others, and you can see a lot of her argument in G. Willow Wilson’s writing for the series. The next generation of superhero characters is too often ignored to focus on the properties that have been around for decades, but Wilson’s work on this title shows the value of using new heroes to offer a different angle on the genre. Kamala’s story is carved from the traditional Marvel mode—person gains superhuman abilities, has to figure out how to balance power and responsibility while juggling a secret identity—but her experience is informed by her Muslim upbringing and the pressures placed on her by her Pakistani-American parents, making her a unique figure in the superhero landscape. As the artist on Brian K. Vaughan’s Runaways, Adrian Alphona has proven that he has an acute skill for realizing teenage characters, understanding their style, body language, and heightened emotional states. His work has only become more stylized and detailed over the years, and these preview pages spotlight his talent for diverse character designs and maximizing the expression of those teens. Add Ian Herring’s ethereal color palette, and you get some of the most striking art currently being produced at Marvel. That combination of riveting writing and enchanting artwork is what makes Ms. Marvel one of The A.V. Club’s Best Comic Series of 2014, and hopefully Kamala’s adventures will only get bigger and better in the new year.